Members of CET can receive the membercard for $15. Simply join CET today or renew your membership, add $15 and a Membercard will be sent to you shortly. What is the CET MemberCard? The CET MemberCard is a new benefit exclusive to public broadcasting stations that offers contributing members 2-for-1 entrees at more than 75 area restaurants in Greater Cincinnati, and more than 8,800 restaurants across the country. In addition, there are arts, attractions and shopping discount benefits. How does the MemberCard work at a Restaurant? Order at least two entrees in a participating restaurant, and the least expensive entree is deducted from your bill. Simply present a valid MemberCard when paying your check and the restaurant will mark out its number on the back of your card. 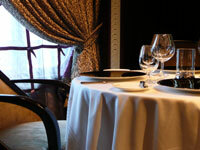 Check the restaurant listings in your directory for any restrictions on each restaurant's offer. How many restaurants are signed up in our area? Currently there are more than 121 area restaurants in Greater Cincinnati including: Arnold's Bar & Grill, The Dubliner, Grand Finale, La Petite France, Pompilio's, Karlo's Bistro Italia, The Spinning Fork, Washington Platform Saloon and Restaurant, Bob Evans, Chuck E. Cheese, Fazoli's, Ponderosa Steakhouse and many, many more. New restaurants are being added regularly. How can I find out which restaurants/organizations currently participate, and how often is the list updated? You will receive a directory of participants when you receive your MemberCard. It's a good idea to check the latest listings before using your Card. The restaurants and other benefit providers are regularly updated on this website and at membercard.com. These web sites are updated frequently to give you the most current listing of the participating restaurants and other organizations. If you prefer, you may also call Member Benefits, Inc. toll-free at 1.888.727.4411. Both local and -- for an additional processing fee -- national benefits are available to you as a CET MemberCard holder. Procedures for traveling with your MemberCard are explained below. Why should I sign up for the MemberCard? It could save you hundreds of dollars each year at restaurants and cultural arts venues throughout the region and around the country -- at the same time you are supporting CET's programs with your contribution. The card is valid for one year, and an expiration date is embossed on each Card. You may use the MemberCard one time during the year at each participating restaurant listed in the directory. If you are currently a CET member and renew your CET membership at any level and add $15, you will continue to receive the Card by mail upon receipt of your contribution. How do I sign up for a card? Make your pledge online on our secure site or call us at: 800-808-0445. Contribute at any level, add $15 and the CET MemberCard will be mailed to you shortly. How do I check listings? Several ways to check current lisitings of your MemberCard benefits. Click here or on the Membercard at the top of the page to see all the current benefits. Or call the MemberCard Hotline at 1-888-727-4411. The MemberCard Hotline is printed on your MemberCard. If you have received satisfactory service, CET suggests you tip the standard 15-20% of the total check (before any deduction is made). Is the MemberCard honored on holidays or in addition to other specials? In most cases, no. The MemberCard is not valid on major US and Canadian holidays, which include: Canada Day, New Year's Eve and Day, Valentine's Day, St. Patrick's Day, Easter, Good Friday, Mother's Day, Memorial Day, Father's Day, Independence Day, Labor Day, Remembrance Day, Victoria Day, Thanksgiving and Christmas Eve and Day. The MemberCard is not valid in conjunction with other specials such as children's plates or appetizers, or in conjunction with other specials offered (Early Bird Specials, etc.). What should I do if a restaurant does not honor my MemberCard? Should any problems arise with any of your MemberCard benefits, please call (800) 423-7645 during normal business hours (EST). This number will put you in touch with Member Benefits Inc. (MBI), the company assisting CET with the MemberCard program. How many public stations offer the MemberCard? Currently, an estimated 1.5 million public broadcasting members enjoy MemberCard benefits through their support of over 130 public broadcasting stations nationwide. How do I take advantage of restaurants or other benefits outside of my station's area? The Public Broadcasting MemberCard is accepted in 48 states in the U.S. and four provinces within Canada. Check the map at the membercard.com web site for more information on the latest MemberCard locations. Call 1-800-423-7645 to order your Travel Pack or order on-line via the membercard.com site. Member Benefits, Inc. will bill you $6.75 for each card to cover the cost of the Card's production, a directory for your destination, and shipping. To enjoy MemberCard benefits outside of CET's viewing area, you must have a special travel card that is valid at your destination. What if I have a favorite restaurant that isn't on the list? May I recommend them to CET? Sure. If you are aware of a restaurant that you would like us to add to the MemberCard program, please call MBI at 1-800-423-7645 weekdays during normal business hours (EST). The Member Benefits staff will contact the restaurant with more information. Please realize each restaurant's participation is voluntary.